FILE - Suspected Uighurs from China's troubled far-western region of Xinjiang, sit inside a temporary shelter after they were detained at the immigration regional headquarters near the Thailand-Malaysia border in Hat Yai, Songkla, March 14, 2014. Refugees in Thailand often arrive on tourist visas and are attempting to escape persecution and fear as minority groups. Human rights and refugee civil society organizations say Thailand’s policies towards asylum seekers and refugees has hardened in recent years amid increasing arrests and deportations, even prior to the military taking power in 2014. But the tougher stance in dealing with Chinese asylum seekers and other dissidents has alarmed rights groups amid what they say is Beijing’s increasing influence over Thailand’s policies towards asylum seekers and refugees. The refugees, often on tourist visas and hoping for official asylum status, are usually escaping persecution and fear as minority groups, especially in South Asia. Julia Mayerhofer, a director with the Asia Pacific Refugee Rights Network, said the security climate in Thailand for refugees has deteriorated for several years. Mayerhofer said earlier signs of momentum towards policies advocating alternatives to detention for refugees especially for children have fallen by the wayside. Refugees and asylum seekers in Thailand remain vulnerable in the absence of national laws and a legal framework, with the country not a co-signer of the 1951 United Nations Refugee Convention. “We see that the situation has been getting worse in that regard. We see more arrests, more crackdowns and the detention [centers] is really, really overcrowded, in particular for urban refugees’ situation here is quite difficult now,” Mayerhofer said. Thai refugee rights groups say there are as many as 10,000 asylum seekers and refugees representing more than 40 nationalities who live in the urban areas of Thailand, largely near the capital of Bangkok. 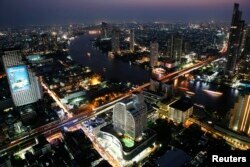 FILE - Cars and trains move on Taksin bridge over Chao Phraya river in central Bangkok, Thailand, at sunset, March 14, 2013. But recent concerns have centered on the detention and extradition of Chinese dissidents and activists in Thailand. In the past year, dozens of Chinese asylum-seekers have been sent back to China by Thai authorities. Rights groups also fear Chinese security services are linked to the abduction in Thailand of people associated with a Hong Kong bookstore selling popular novels on China’s leadership. The United Nations has raised strong concerns over the deportation of two Chinese activists by Thailand late last year, who, the UN said, risked torture and ill treatment by authorities once back in China. Phil Robertson, deputy Asia director for Human Rights Watch, says the pursuit of Chinese dissidents outside the country appears to have official backing by China’s government. “Much of this frankly is coming from the Government in China and [President] Xi Jinping’s crackdown on human rights. What makes China different from a lot of other countries in South East Asia is that they actually pursue their dissidents outside the country,” Robertson said. The August 2015 bombing on a religious shrine in central Bangkok targeting foreign visitors, especially Chinese, leaving more than 20 people dead, was blamed on ethnic Uighurs, a Muslim minority from western Xinjiang province. Many analysts said the bombing was likely tied to Thailand’s sending more than 100 male Uighur asylum seekers back to China. The group of men had been part of a group of over 300 ethnic Uighur who had fled to Thailand in a bid to travel to Turkey. Earlier, some 180 Uighurs, mostly women and children, were allowed to travel to Turkey after months of negotiations. Chinese authorities claimed the deportees were terrorist suspects and the men were extradited under a Sino-Thai bilateral agreement, but without any assessment of protections needs, says refugee rights groups. Other targets by Chinese authorities include practitioners of the Falun Gong spiritual movement, which is banned in China. Human Rights Watch’s Robertson said China pressures regional countries in South East Asia to hand such asylum seekers back to Beijing. “China follows these people, it chases them down – So you have the pursuit of the Uighur, you have the pursuit of these political dissidents, the Falun Gong – an active effort to pressure other governments like Thailand, Malaysia, Cambodia, Vietnam, to hand these people back,” he said . He said Thailand fears that if it acts humanely towards any group, this will create a “pull factor” for others to follow. “As a result we have all sorts of problems with asylum seekers – refugees being arrested – we have problems with the children of these people being held in detention,” he said. A recent joint statement by Thai-based refugee groups to a rights conference in Geneva said those extradited face risk of persecution, torture or enforced disappearance once returned to China. The refugee groups said Thailand needs to “intensify efforts” to better respect the rights of asylum seekers and refugees as well as ratifying the international conventions overseeing refugee and asylum rights. A spokesperson for the U.N.’s High Commission for Refugees (UNHCR) told VOA it continues with efforts to ensure Thai officials and courts respect UNHCR-issued documents and that refugees and asylum seekers should neither be arrested nor detained.